Farm Girl Pink....: Pink and Turquoise.... lots of love for both! 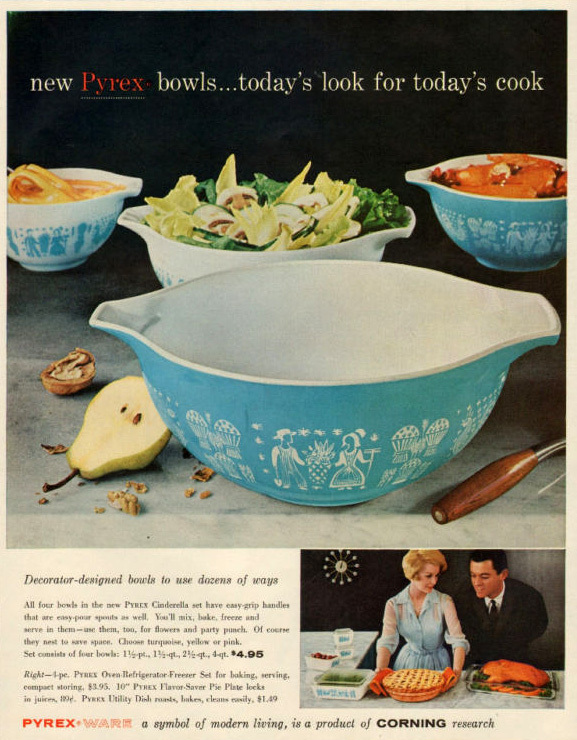 I never get tired of the Pyrex Pink Gooseberry. I had been on the hunt for the bigger refrigerator size dishes to go with the small ones I had got for Christmas. These are my glorious Gooseberry refrigerator (the long ones) containers. I have only one solid pink dish. So I have it mixed in with the lovely (small) Gooseberry's. Pyrex made some truly gorgeous turquoise glassware. But this is the set of bowls that I truly like to own. But I have yet to come across them in person. That is, a full set of them all together. I have seen random misc bowls at antique stores. They have always been grossly overpriced. And really not in good shape. So I am still on the quest to find myself a set of them. My mom collected the Butterprint items for years. She had both sets of bowls you shared, casseroles, butter dish, the whole shebang. She gave them to my sister recently. I think they are so pretty. 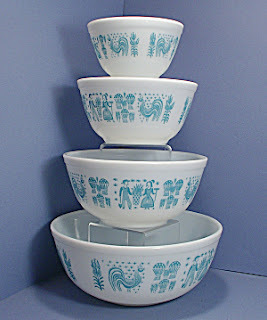 What annoys me so much... is I used to see those turquoise bowls at every antique mall I walked in. That is till I decided to purchase a set of them. Now all I can find is random... beat up and fading bowls. And they are priced as if they are mint. I don't pay prices like that for beat up faded bowls. The pinks are gorgeous, of course! I know you'll find the turquoise soon. Just keep hunting. my mother has the bottom set (photo in magazine). I know she has the large one in harvest gold. I think that my sister and I will fight over it! love those gooseberries.